FERRUM — When asked about the future of Virginia’s economy, there is one industry at the top of Sen. Mark Warner’s mind. “If I was starting all over again, the area that I would go into is unmanned systems,” he said. Warner, who was an early investor in cellular service provider Nextel, said he has a keen interest in technology and the ways it can be used to improve lives. That interest has made him an advocate for the use of unmanned systems, specifically drones, in the commonwealth. 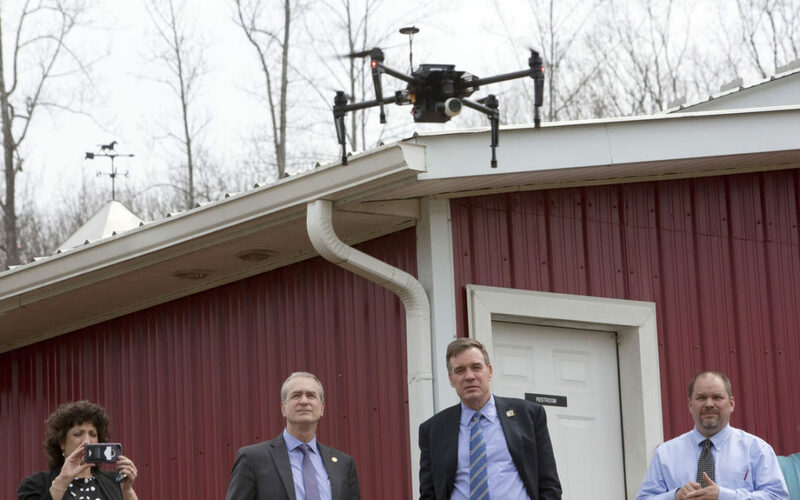 On Wednesday, Warner visited the Titmus Agricultural Center at Ferrum College for a presentation on the use of drones in agriculture. It was one of six stops on a three-day tour of Southwest Virginia. “Anyone who has an interest in eating has a vested interest in what’s going on in this space right here,” Ferrum President David Johns said. Samantha Smith-Herndon is a research assistant with the Institute for Advanced Learning and Research specializing in precision agriculture. She described the agency’s work in using drones equipped with remote sensors to monitor crop health. The agency works to educate farmers and make the technology available to them. “This is next generation precision agriculture technology, so we want to focus on the next generation of farmers who are more likely to adopt this technology moving forward,” Smith-Herndon said. The technology was used at John Ayers’ Patrick County vineyard. He’d begun to have trouble in parts of a 4.56-acre block of vidal blanc grapes. He suspected a viral infection and said it seemed to be moving. The technology helped to identify which plants were troublesome and needed to be replaced. Although he was already aware of a problem, Ayers said, he wouldn’t have recognized its severity without the data collected by the drone.